In this lesson, you will learn how to use the PHP switch statement which lets you an easy alternative of writing multiple if-else statements. PHP switch statement compares a variable or an expression against many different values and executes an associated code block if the comparison results as Boolean value true. It’s quite essential to understand who the compiler parses the switch statement to avoid error in the logic. In PHP, the switch statement gets executed from the beginning to the end, one line at a time. In the beginning, no code is executed. The variable or expression given in the parenthesis of the switch is evaluated first and compare with each case presented. The code inside the case statement is executed only when the expression of that case is evaluated to be true. Here, if $i is equal to 1, PHP will execute all of the echo statements. If $i is equal to 2, PHP will execute the last two echo statements. 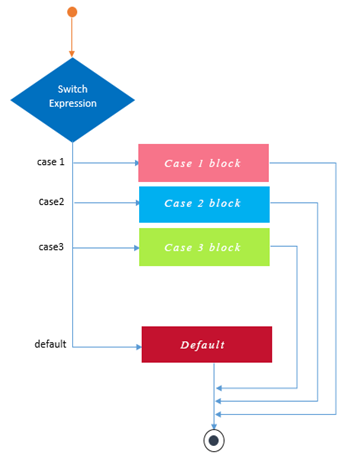 In PHP, the condition given in a switch statement is evaluated only once, and the result is compared to each case statement. In an else-if statement, the condition is re-evaluated. Tip: Switch statement is faster than multiple if-else statements. So if you are writing a situation where exact values are supposed to be compared, use a switch statement instead of multiple if-else statements. In PHP you can also use functions in a switch statement.